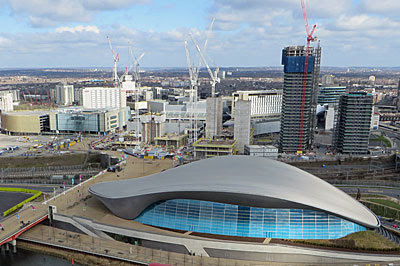 Have you been up the Orbit recently? No of course you haven't. It does attract visitors - there were more than a dozen foreign tourists up there on my last visit. But at other times the observation deck is an empty void, indeed I've been up top more than once when the staff were desperately pleased to finally have somebody to talk to. West Ham's new stadium, for a start. It doesn't have an official name yet, which still worries me, but it does now have a proper roof to keep the extended seating area dry. Those trademark triangular floodlights now point down rather than up, and the black seats are being swapped for claret replacements (you can see a lot of these stacked up behind Pudding Mill Lane station). A properly-sealed perimeter now surrounds the exterior at ground level, this so that Stadium Island can at last become a public space. 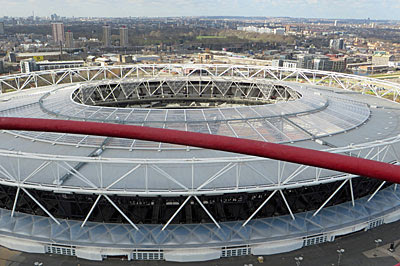 And West Ham finally move in in mid-August, not that being up the Orbit will allow you to see anything on the pitch, so don't get any ideas. 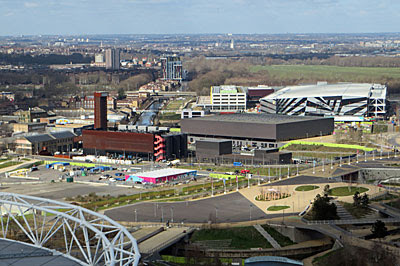 The main spine of the Olympic Park stretches out to the north, with the tarmacky bit closest to, and the prettier parkland further beyond. They echo emptily on late winter weekdays, but not terminally so, and they'll be full enough as the weather finally warms up. That replacement bridge they were building in the northern parklands is now complete, and looks surprisingly like what it replaced. More companies have moved into the digital shed at Here East, which cringingly claims to boast "creative businesses growing in scale joining businesses of scale growing in creativity". Hackney Wick beware, you might just be swallowed whole. Between the Park and Westfield a wall of skyscrapers is going up. This is the International Quarter, a permanent screen of business real estate as Stratford City edges outwards. We'll be allowed to walk between the towers once they're built, but for now the main pedestrian access point has been shifted northwards and you'll have to make do. Between the railway and the water's edge is the site of Olympicopolis, which if no better name turns up we'll be stuck with calling it forever, the eventual destination for the V&A, Sadler's Wells and the Smithsonian. A public consultation on the plans has just completed, not that I bet you noticed, nor that it'll make a blind bit of difference. Another consultation was also held recently for the UCL East masterplan, which I pointlessly turned up to for an overview of scheduled plans. The featureless lawn to the south of the Orbit is destined to become a suite of campus buildings, just the one to begin with, while the two desolate spaces to the south of the Aquatic Centre will become student digs. They'll be expensive cramped blocks, obviously, but conveniently located for the shops should your massive student debt allow. Beyond the railway (close to Pudding Mill Lane station) are half the replacement allotments for the pre-Games Manor Gardens site, a small hamlet of Toytown sheds with seemingly empty patches of earth alongside. I've never seen anybody using them, but apparently the first tenants are already tilling the soil to get it ready for vegetable production, with first fruits expected later this year. With Crossrail still faffing about on the adjacent land, two riverside pedestrian exits from the southern end of the park still aren't open to the public, and the Greenway is still very blocked beyond that. 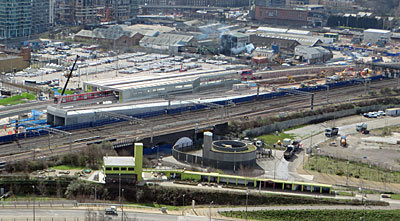 But the portal that Crossrail trains will one day emerge from is now very much in place, with twin concrete shells rising rapidly to a letterbox exit almost precisely where the old DLR platforms used to be. Crossrail are also about to cause significant disruption on the River Lea towpath. 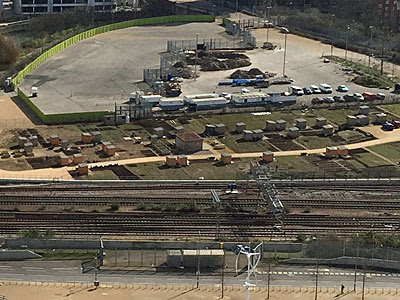 A new electricity substation is being built to power future trains, close to the existing railway bridge, and this means shutting off access from Monday 21st March onwards. A floating walkway will be built alongside the disruption, meaning pedestrians and bikes can return from late April, while construction work continues for another year. Meanwhile Thames Water are taking the opportunity to work on some pipes under the towpath nearer the Greenway, which means the entire section from the Bow Roundabout to Old Ford Lock will be out of bounds for about five weeks. You can read all about this on East London's dullest website, puddingmilllanesubstation.com, and there's a Google map of the diversion too. 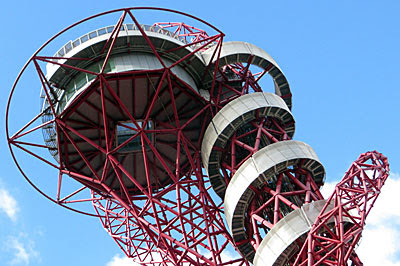 Meanwhile the Orbit had better get on with building its slide if it wants a flood of visitors to arrive. On my last visit earlier this month a ground level construction paddock was in place but no start on the upper access point had been made, and no twisty tubes were in place. 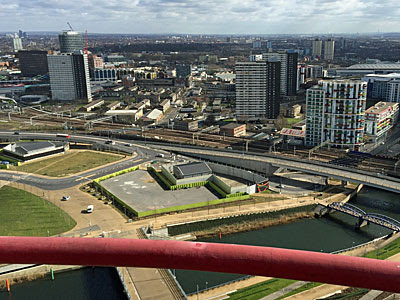 If all goes to plan then by the end of May you'll be able to slide down for a fiver - that's on top of the cost of going up the tower anyway, a price which it was hinted might be increasing, for local resident rates at least. But come on, where else are you going to be able to look down on a park, a construction site, a claret stadium, a construction site, some allotments and several more construction sites? That slide had really better pull the punters, huh?